This is the Canon 7D. Swaddled in TFA Grape. Yes, I said swaddled. Because nothing says love like TFA yarn. No Patons cop-out for my camera! There is a reason, besides just reaching for hitherto unheard of levels of crafting madness; it protects her from the elements, and allows me to tuck in a few hand-warmers around the battery casing which extends the life of lithium batteries in the cold. Really – it works. I’m taking her snow shoeing in Tobermory in a few weeks, so I’ll need it. While I’m at it I’ll give you another little nugget of wisdom – if you’re taking your camera out in elements of dubious merit (rain, rainforest, fog etc.) then do this first: Go to a shoe store, ask them for a bag of the silica gel packs (most stores throw away a ton of these things every day) and pack a bunch of them into your camera case. 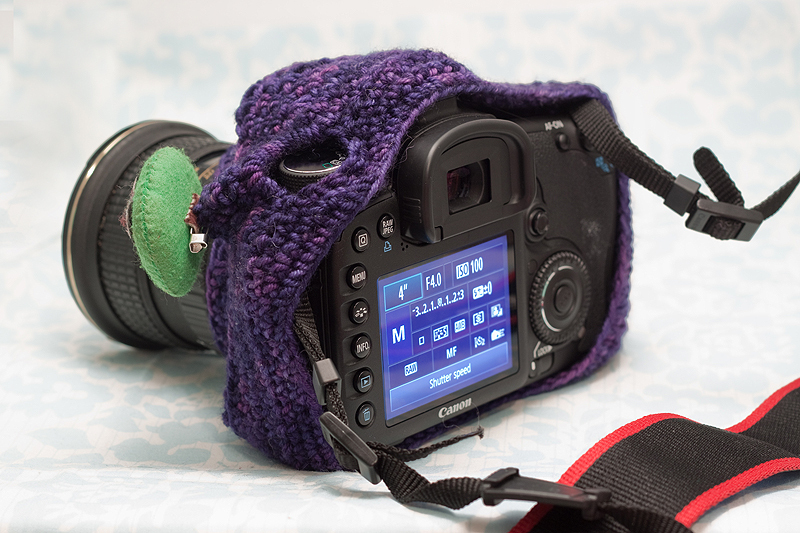 Even if you’re just moving in from the cold and to a warm room, and you’re worried about condensation inside of the camera body – try this trick. I can’t take credit for this nugget of wisdom – when I told the people at Henrys that I would be taking the camera canoeing up the Amazon river and did they have any suggestions, they could only (with sad faces), wish me good luck. When I mentioned it casually to someone at Mountain Equipment Co-Op they said ‘Hmmm… I wonder if this would work?’ and took me to the shoe department. Well, that person was a genius and I have them to thank for successfully taking a V.1. Rebel, plastic casing and all, from the Andes to the Amazon with absolutely no problem. 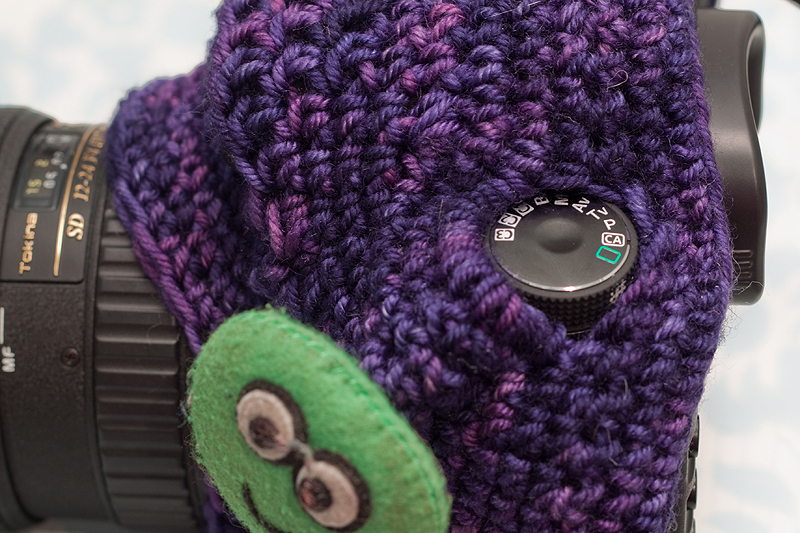 I left openings in the cosy for all important things, like the tripod foot and the dial for changing shooting modes, settings and of course, the shutter button. The grody little boogly face on the right was given to me (and my 50D) in Madrid by a very nice girl who came up to me at random and gave it to me for good luck. I took some very fine shots in Spain, so I suppose it worked out for me =o) I’ve kept it on the camera ever since. 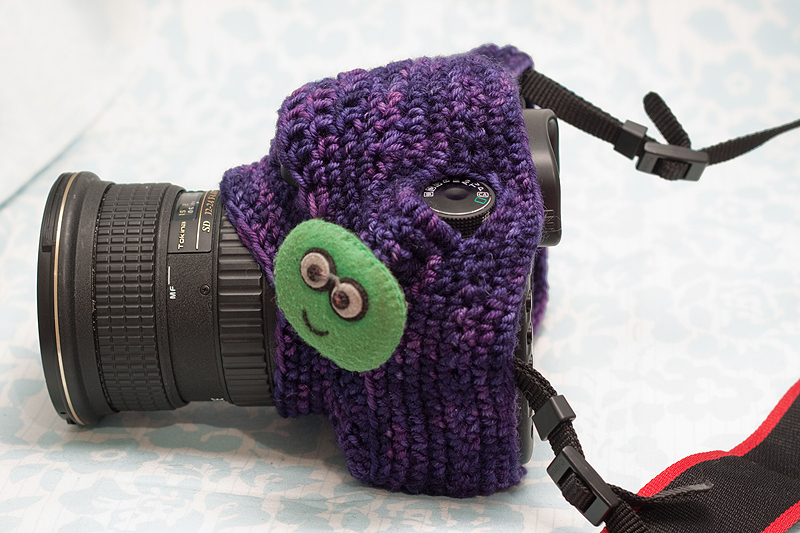 Many of the cameras other settings are accessed through the back LCD – so I didn’t need to leave anything else free. It’s quite the engineering feat if you think about it. And yes, I’m talking about the cosy and not the camera, which we can assume is an amazing piece of equipment and which I love dearly. I’ve been a Canon shooter for over 12 years, and this, my latest appropriation, is a pretty damn amazing camera! My 50D is being gifted to my beautiful friend Yvette, who I’ve known nearly all of my life and who is moving on to new adventures in New Brunswick next month. I can’t wait to see what beautiful work she does with it! Am I not just about the luckiest woman alive? What an incredible gift from my dear friend! Shireen! I am still absolutely floored you are gifting me your camera!!! AHHH! I can’t wait to tromp around the East Coast with it. It will travel with me everywhere I go. You are the greatest ever! And the hat that survived the launch on friday… I already know it will last me a lifetime and always remind me of how wonderful you are and all that you have done to help and support me. I can’t thank you enough. I have to say this is SOOO you! 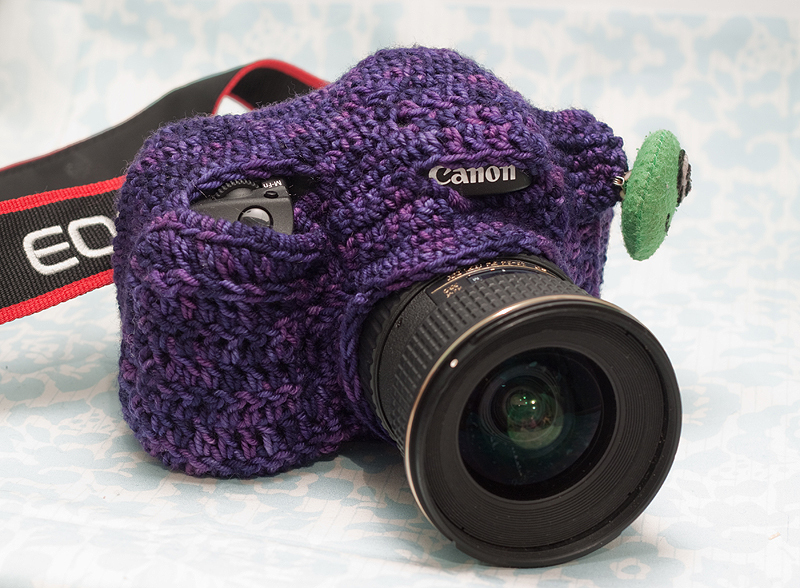 To make a snuggly for your camera. It is brilliant! It is practical and it is cute. Um… yes… I actually used the word “cute” in a sentence… in public no less! lol. This is wonderful Shireen! No doubt you will be hounded for orders soon. Love the snuggly, great idea. Okay, I officially wish to be put on the list for the 7D when you change camera’s again. Hello Shireen! Vow you had again the most unique idea! I believe that it’s also very useful and good to protect your ‘baby’! Thanks for a tip to avoid the humidity! I wish you the most exiting and wonderful journey! does it affect the focus? It’s definitely niche ;o) And I’m glad it made you laugh! It certainly made me laugh as I was building it. Oh, and it doesn’t affect the focus at all. Re: selling these commercially Yvette – I will refrain; to ensure a snug fit this was crocheted right around my camera and built to expose the settings that I know I personally use a lot – I don’t think I could presume to do that for other people’s cameras, particularly models I am unfamiliar with. Pretty please make me one? Please??? 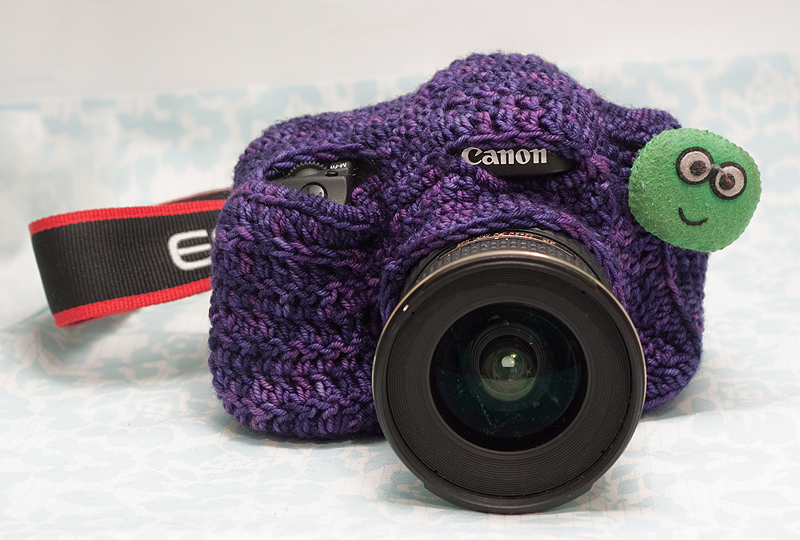 my mom has a Canon Mark 5D, i assume they are about the same size, do you have a pattern for this i would love to make it for her for christmas. 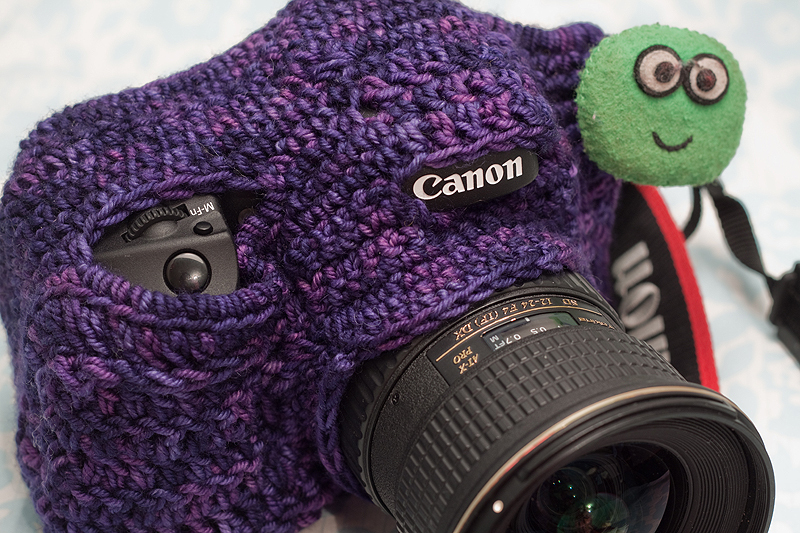 I did not have a pattern for it – I just crocheted around my own camera and adjusted things as I went – hope that helps, and good luck! wow, very cute, and looks more cool. 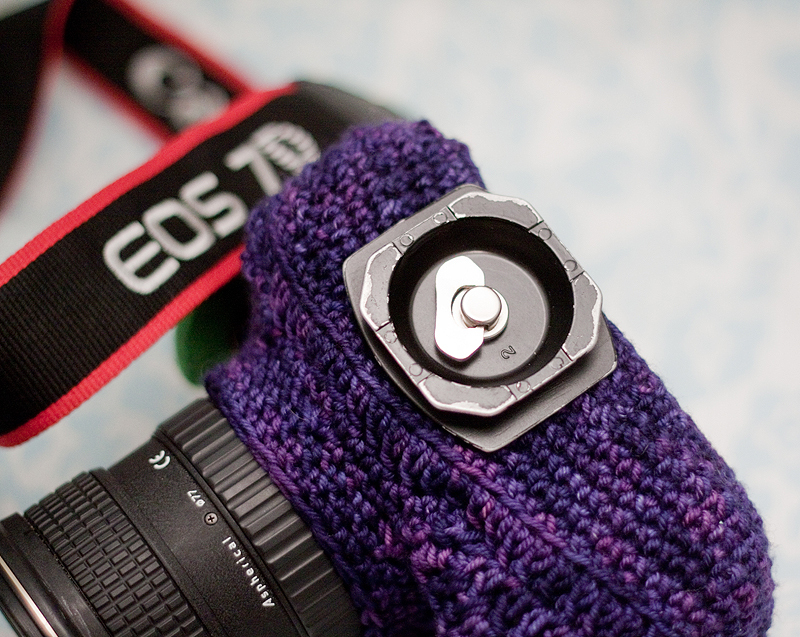 I think my 7D needs one of these. Would you consider selling one? I love this idea, but I’m terribly horrendous when it comes to attempting crochet. If so, how much would you charge?? Hey! Thanks for asking, but alas I do not sell them. The time it took would make it pretty difficult to put a practical price on it, I recommend making friends with some crochet people! I need to make something like this, maybe with some felt sewed into the inside. I work up in the north and it goes down -50c at night, that’s when the northern lights come out. Last time I went to take photos my camera went from full battery to nearly 0 in half an hour. I can imagine! Still, I’m kinda jealous of where you get to work :) I buy the hand warmers and slide them in around the battery compartment, I find it helps.